Dinjik dhah dzirh [moose-skin mittens]. Dzirh tł‘yàa [mitten strings]. Sometimes you put rabbit skin inside. But when there are no rabbit skins they use caribou hair; they cut it and put it inside. When they travel, they don’t get cold. Moose-skin mittens, often beaded with leaf and flower designs, are designed for the deep cold of northern Athabascan country. 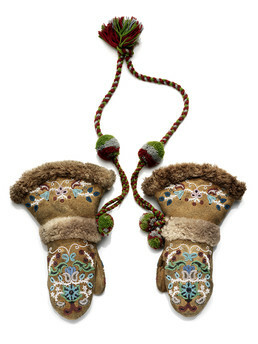 These long, gauntlet-style Gwich’in mittens have wide tops to accommodate the sleeves of a parka. Bands of beaver fur encircle the cuff and wrist, and the braided yarn neck string is decorated with pompoms. Eliza Jones said, “When it’s windy, this beaver fur right here is good to hold against your face to warm it up.” Small glass and metal beads were used to work the intricate floral patterns. Trimble Gilbert: This is heavy liner in there. It’s for cold weather. Eliza Jones: Wool cloth. . . . wool all the way through. This looks like our style, right? Judy Woods: Yes, the way it’s cut. Eliza Jones: The beadwork is different, but our mittens are same way with beaver trim right here and right here [cuffs]. . . . Look at those metal beads on the inside. . . . It’s the shiny beads right in the center where it’s brown. Aron Crowell: And those are an old style of beads? Judy Woods: Yes, seen that when we were kids. There were different colors too. You could see it, just like blue or something. I thought they used to be so pretty. Eliza Jones: Yes wider, so you could put other gloves inside when you’re traveling. Sometimes it gets really cold. And the mitten strings is different. . . . Yes, this is different. And ours would be just one whole piece and then another piece across here. On the other mittens, this would be braided like this, and the one that’s braided for a cross here sometimes has a different braiding than this. . . . It could either be a square braiding or little flatter and wider braided piece across here. . . . And the tassel on here is different. . . .
Judy Woods: We used to make them [tassels] just for dog harness. . . .
Eliza Jones: When people move in from camp, they put on their good clothes, and then to come into the village.They attach the tassels to the dogs, so the dogs come in all dressed up too. It seems like it was always red and blue or red and green. Judy Woods: Yes, it was pretty. Trimble Gilbert: . . . for cold weather. Dinjik dhah dzirh [mooseskin mittens], . . . dzirh tł‘yàa [mitten strings]. Sometimes you put rabbit skin inside. But when there’s no rabbit skins, then caribou hair. They cut it and they put it inside, and they travel, they don’t get cold. So it help. I know we used to wear this kind, fancy one. We still got quite a few of this at home. Matthew Gilbert: Yes, there’s still kids that wear it. Trimble Gilbert: Yes. And the reason this [wide cuff] and it’s wide, is if you wear some kind of parka, you won’t freeze your wrists. . . . Protect from wind. Judy Woods: Gosh that’s fancy. You could see it was inked. Kate Duncan: She drew the pattern on with ink? Kate Duncan: Was it red ink or black? Eliza Jones: I don’t know if I mentioned this, but most of our mittens are only beaded up at the top – not here [front of hand] and not on the thumb. Judy Woods: Not on the thumb, because when it’s cold, they put their [back of hand covers mouth and nose]. Eliza Jones: Yes, this [hand covers mouth and nose]. Judy Woods: Beads will get cold. Eliza Jones: This beaver fur right here, is good when it’s windy. You hold it up against your face like this [back of hand covers mouth and nose]. Warm up your face with it. Matthew Gilbert: It’s really warm. Eliza Jones: It’s really practical for that. Matthew Gilbert: I did it a lot as a kid.